A subsidiary of Swedish supercar marque Koenigsegg has been working on a new type of valve system for engines that does away completely with the camshaft, hence the descriptor “camless” is often used. That subsidiary is FreeValve (previously Cargine), which has published a video that shows the inner workings of its revolutionary engine. The engine relies on pneumatic valve actuators to open valves, which are then closed by air pressure or springs. Each of the valves can be controlled individually, which enables infinitely variable valve lift and duration as well as easy cylinder deactivation. A pneumatic valvetrain also draws less energy from the engine than conventional cams. This is all said to result in both significant gains in output (up to a 30 percent increase in horsepower and torque) and a jump in fuel economy (also up to 30 percent). Overall emissions are said to be reduced significantly as well. So what’s the hold up? Reliability, refinement and noise levels aren’t up to scratch and remain the biggest hurdles in the technology's advancement. And while such technologies won’t ultimately save the internal combustion engine from being replaced by electric motors in more and more cars, they should at least help prolong it. I wonder though... what happens if a small leak develops? I mean, it seems to happen to all engines eventually. Is there a chance of interference occurring between the valves and pistons because of a leak? These are both from a couple years ago. SUVs are hot right now, and as a result, even exotic car companies are getting in on the action. You can't blame a company like Bentley or Maserati for offering products that are in demand, but at the same time, it's a little disappointing they feel pressured to do so. The good news is, Koenigsegg has no intention of following suit. Speaking to Top Gear at the Geneva Motor Show this year, Christian von Koenigsegg said it's technically possible to build an SUV on the company's platform, but he doesn't want to. To make our carbon chassis into an SUV, you'd have to stretch that chassis. You'd keep the front and rear ends as they are, go more extreme on the thickness of the honeycomb, you'd put a carbon cage structure up top . . . technically I don't see a big issue with it . . .But I'm just not a fan of SUVs. To me they are fundamentally flawed. Sure we could sell them, but I don't want to. So if Koenigsegg isn't working on an SUV, what is it working on? A sedan. "It's a project we've been working on for quite some time. I'd be surprised if that's the next thing we release—because we're getting such a good response for our traditional type of supercars—but it's a car I'd love to do," von Koenigsegg said. What a Koenigsegg sedan would look like we can only guess, but we have a feeling it's going to be wild. Koenigsegg isn’t resting easy after claiming the 0-400kph-0 and production car top speed records in a wild 2017. Founder and boss Christian von Koenigsegg tells Top Gear that work is well underway on a new supercar, to replace the Agera. Christian said: “We have a replacement car coming after the Agera RS. The Regera is, let’s say, the best car we can build for ‘normal road use’. It’s a kind of GT car. Considering whether or not Koenigsegg would pursue more lap and speed records – with either the Agera or the new model – the boss said: “I think both are capable, but the replacement is even more extreme.” Our tiny mind boggles. So, what of the spec? CvK divulged a few precious details. He confirmed the car won’t use a hybrid system, so as to separate it from the Regera. Instead, it’ll stick with a development of the company’s twin-turbo V8. “We refining it, making it a little bit lighter, a little bit stronger… the thing with that engine is that there’s seemingly no end to what we can do with it. We polish it out, we open it up, and suddenly we have 20 or 30 more horsepower, and it’s even stronger and more reliable. It’s fascinating how capable the structure is. Unlike the Regera, the ‘Son of Agera’ won’t use the Direct Drive transmission, and will instead use a (relatively) conventional paddleshift gearbox. However, like all Koenigseggs to date, it will keep its open-top targa-roof bodystyle. “Yes, it’s our signature thing, like our doors. We are two cars in one – and the roof fits in the front,” said Christian. What about the Regera? That’s selling nicely. Koenigsegg has ramped up production capacity, and will double its factory space in October 2018. Impressively, the waiting time for the 1,500bhp hybrid ‘hyper-GT’ has been slashed from four years to less than two in a mere 12 months. “I’m expecting by the end of the summer to be employing over 200 people”, Christian said. In November 2017, the Koenigsegg Agera RS famously blasted through the Nevada desert at an average speed of 277.9mph, on only its second flat-out run. But it could have gone even faster. Speaking to TopGear.com at the Geneva Motor Show, we asked boss Christian von Koenigsegg if he has any niggling, fleeting wishes about trying to push it a bit harder on the day. It’s heartening to see Christian isn’t tempted by bigger headlines, and puts the safety of his test driver, Niklas Lilja, as number one concern. Quite rightly too, you’ll agree. But does that mean he encourages Hennessey, Bugatti, Rimac or whoever not to run the high-speed, 280mph+ record risk? “Oh, no no no”, he shakes his head. “I expect we will be beaten. I was expecting Bugatti to announce that they have beaten us at this [Geneva] show! So, would Koenigsegg provide support if a lap record was being attempted? Could've sworn they said they hit the limiter on the outbound (downhill/tailwind) Vegas run. Koenigsegg only builds a handful of its high-value hypercarseach year, and sells them through a small network of dealers around the world. So the opening of a new showroom might be news in and of itself. But what’s caught our attention here is not the opening of the dealership, but what the manufacturer showed there. At the opening of the new franchise at Lorbek Luxury Cars in Melbourne, Australia, this week, Koenigsegg showed guests this teaser sketch for its next exotic hypercar. Billed as the replacement for the Agera RS, the new model is slated to be unveiled at the 2019 Geneva Motor Show next March. With the Agera RS and Regera hybrid both completely sold out, this as-yet unseen new model is the only one that Koenigsegg currently has available for order. And we don’t know much about it yet. From the bare outline, the bodywork (at least from behind) looks completely different to those of the Agera or Regera – curvier than the former, and more aggressive than the latter, especially around those rear fenders. That giant rear wing looks different too, but the stance and double-bubble cockpit look distinctly Koenigsegg. Given the company’s track record, the new model will likely be faster and more powerful than anything Christian von Koenigsegg and company have made to date – and likely more expensive, too. 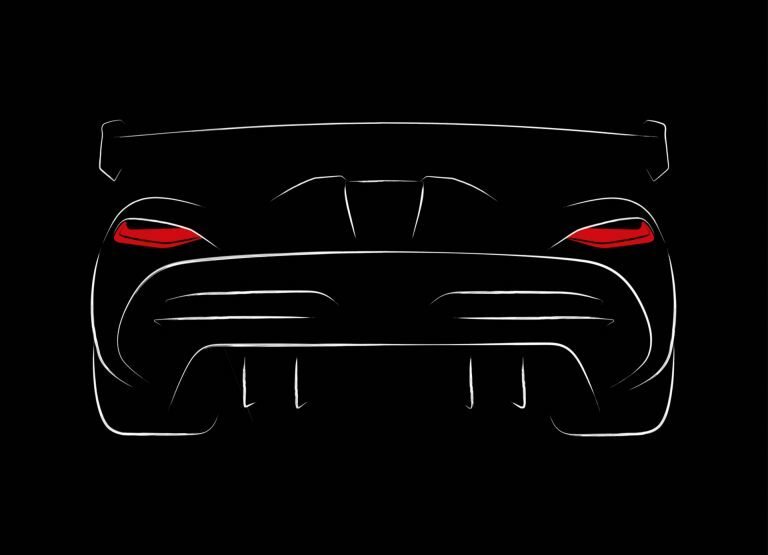 It will also likely carry a new name to differentiate it from the Agera, but the big question on our minds is whether it’ll be a hybrid or a completely internal-combustion affair. Considering that it’s being billed as the successor to the Agera RS (and not to the Regera), we’d bank on the latter. But we’ll have to wait to find out more of the parameters as the reveal (about nine months from now) approaches. Removing the Regera’s combustion engine would turn it into the most advanced EV in the world, says company boss. Koenigsegg was founded nearly a quarter of a century ago, but it wasn’t until 2002 when company’s first production model, the CC8S, was delivered to a customer. Fast forward to present day, the Swedish niche marque has assembled a total of only about 120 cars – enough to put the company on the high-end automotive map. The most popular model of them all is undoubtedly the Agera RS, officially the world’s fastest production car after that magical weekend in Nevada last November when it took down an additional four records. While the Agera RS may be getting all the attention these days, let’s keep in mind the Regera pictured here is actually Koenigsegg’s flagship. Already sold out, the hybrid hypercar will be produced in only 80 examples at about $1.9 million a pop. Armed with a biturbo 5.0-liter V8 and three electric motors, the Regera catapults itself to 62 mph (100 kph) in 2.8 seconds and tops out at more than 250 mph (400 kph). One way to do things in the future would be to increase the EV component of the powertrain without getting rid of the ICE to create powerful hybrids, but ultimately, Christian believes fully electric models will come as a direct consequence of the continuously developing technology. But there is a problem with entirely electric vehicles, and that would have to be the noise. While EVs are not entirely silent, the sound generated by these zero-emissions cars is not exactly appealing when compared to the grunt provided by a big V8 engine. For this reason alone, Christian von Koenigsegg believes the Regera offers the best of both worlds by combining the benefits of an electric powertrain with the aural experience of an ICE-powered car. Christian von Koenigsegg, the man behind the company that holds the current record for world's fastest car, does not like to be outdone. So he did not particularly enjoy hearing the numbers regarding the forthcoming next-generation Tesla Roadster and its vaunted 1.9-second 0-60 mph time. "We kind of had our future mapped out, and then we heard about the new Tesla Roadster and its insane acceleration numbers, and we thought 'Damn, that's put the gauntlet down,'" the Koenigsegg founder and CEO told Top Gear. As he told the site, he enlisted his engineers to start running numbers, and within a couple of days, they'd figured out a solution. "The simplest way of putting it is like this: It's combining direct drive with the hybridization we have in a different format with free-valve engine technology, in a peculiar layout," von Koenigsegg said. He said the powertrain could take a car from 0-250 mph in 14 seconds "or something like this," and said he wants to make a combustion engine with a higher power density than an electric powertrain "for as long as possible." His talk about hybrids brings to mind the Koenigsegg Regera plug-in hybrid, which weighs just 3,505 pounds and puts out more than 1,500 horsepower. It does 0-62 mph in 2.8 seconds — impressive, but a full 0.9 seconds less than the Roadster's purported time. And not surprising for a company that is all about maximizing ponies, Koenigsegg likes to geek out over the details of things like the design of the 1,160-hp Agera RS engine. Could he be talking about the same vehicle as the successor to the Agera RS, rumored to be called Ragnarok? Tesla, meanwhile, unveiled said Roadster at Grand Basel in Switzerland — or rather, it showed off what appeared to be a white, empty design shell that had been shown last year at Tesla's shareholder meeting. And don't forget that the mad scientists over at Hennessey are tinkering with the 7.6-liter V8 for the Venom F5, the key to its quest to hit 300 mph. So buckle your seat belts, boys and girls: Things are about to get very fast. Christian von Koenigsegg runs one of the industry’s leading supercar manufacturers when it comes to actual performance, but production barely exceeds a dozen vehicles a year. The Swedish entrepreneur is not happy with being a boutique automaker anymore and wants to drastically up those numbers and turn Koenigsegg into a legitimate Ferrari rival. Talking to Bloomberg, von Koenigsegg revealed that his company will be producing hundreds of vehicles a year by 2022, and after that, he plans to lift annual output to thousands of vehicles. Koenigsegg recently confirmed that its working on an all-new ‘entry level’ model priced at roughly $1 million. According to reports, it could feature a 1050 hp hybrid V8 engine and will be the car to boost the firm’s annual production into the hundreds. All current Koenigsegg models are constructed by hand at the firm’s sole production site in Angelholm, Sweden. However, production of this new model will be housed in a former Saab complex roughly three hours north in Trollhattan. Koenigsegg’s recent $320 million deal with National Electric Vehicles Sweden (NEVS) is the catalyst for these bold production plans. The more accessible supercar will use the company’s cutting-edge ‘freevalve’ camless combustion engine that allows the car to be started on pure alcohol, making the engine CO2 neutral. If the engine technology proves itself on the road, Koenigsegg will likely introduce it to other future models as well. Von Koenigsegg didn’t tell Bloomberg how the company will eventually build thousands of vehicles a year, but in order to achieve this ambitious targhet will clearly call for the introduction of cheaper models, possibly even one to rival the Ferrari 488 GTB, Lamborghini Huracan, and McLaren 720S. Despite the million bucks hypercar “entry level” hypercar being cheaper than the ones currently available by Koenigsegg, it’s very hard to imagine it selling a few thousand units per year. Which is very good news for any petrolhead, as it means even more supercars to enjoy, whether it’s owning, driving or simply viewing them in videos. In January, Koenigsegg struck a joint-venture and investment deal with National Electric Vehicle Sweden (NEVS). The Chinese electric car firm put in $171 million to take a 20 percent stake in the Swedish supercar maker, and a 65 percent stake in a collaboration to "develop a product for new and untapped segments." One fruit of the union will be a less expensive supercar that uses Koenigsegg's "freevalve" camless tech and could be carbon neutral. When the news first broke, the "affordable" Koenigsegg was estimated to come in around one million euro, or $1.15 million. In an interview with Road & Track, Christian von Koenigsegg nudged that downward in saying, "Let's say somewhere between 6-7-800,000, depending on the specification." That would be about $683,000 to $910,000. You might not find that kind of coin in your couch, but it's less than half the starting price of the $2M Regera KNC like the one pictured above. Hitching up to NEVS no doubt surprised a few folk, but Koenigsegg explained that his company "has been working with NEVS for many years to utilize testing facilities in Trollhättan, where Saab used to be." That's because NEVS bought Saab's assets when the erstwhile Swedish carmaker went out of business in 2011. NEVS hasn't produced it own car yet, but owns resources such as emission test labs, climate chambers, test tracks and crash facilities that Koenigsegg has taken advantage of for its own cars. The coming supercar will be engineered, developed and built in Ängelholm and badged a Koenigsegg. With production volumes of a couple hundred units per year, NEVS could assist with extra production capacity for behind-the-scenes parts like subframes and wiring harnesses if needed. That will allow the hypercar brand to concentrate on using the car as a showcase for its in-house technologies like direct drive and its infotainment systems. Ultimately, Koenigsegg wants to work with other companies, helping with "platforms, electrical systems, carbon fiber wheels, and various other solutions that will trickle down to normal cars." The firm's V8, in naturally-aspirated form, will provide power alongside some sort of battery-powered electrification. Under development for two years already, we should see it for the first time at the 2020 Geneva Motor Show.